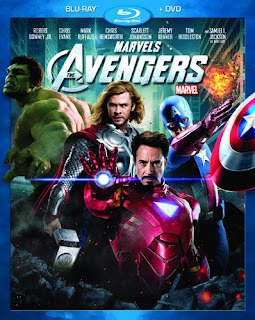 From director Joss Whedon, Marvel's The Avengers, the third highest grossing movie of all-time, is coming to Blu-ray and DVD on the 25th. Over the years many super hero films have been huge successes, such as Christopher Nolan's Batman trilogy, and many have been huge disasters such as the recent Green Lantern or Jonah Hex. The biggest blockbuster of 2012 featured a half dozen of Marvel's comic heroes including Iron Man, The Incredible Hulk, Captain America, Thor, Black Widow, and Hawkeye. The team-up concept is common in comic books, but had never been attempted in such a scale in major motion pictures. Marvel gambled on the concept, and it has paid huge dividends with over $1.5 brillion in total box office. The Avengers assembled by Nick Fury of S.H.E.I.L.D to fight the threat posed to the earth by Loki and his outer space allies. The movie is filled with super hero action and a pleasantly surprising amount of humor that peppered through out the film. Despite the large ensemble cast, each member of the team is given ample screen time and development. Listen to episode 42 of The Random City Podcast for more discussion of the film. These heroes were featured in five movies leading up to The Avengers. Iron Man (2008) was at the time, a surprise hit for a lesser known Marvel Super Hero, and revitalized the career of star Robert Downey, Jr. Later than summer, The Incredible Hulk (2008) starring Ed Norton was released from Universal and was much improved from Ang Lee's Hulk (2003). Iron Man 2 (2010) was another big hit for Marvel and Paramount. The Black Widow debuted in this movie, as Tony Stark's new assistant, who also happened to be a S.H.E.I.L.D agent. Nick Fury, director of S.H.E.I.L.D made his way from coda of Iron Man into the a larger role in this sequel and the Marvel universe. The success continued the following year with Thor (2011) with newcomer Chris Hemsworth as Thor and Tom Hiddelston as Loki, Thor's evil adopted brother who goes on to the main antagonist in The Avengers. Hawkeye also made a brief cameo in Thor. Later that summer, Captain America: The First Avenger (2011) starring Chris Evans continued Marvel's magic touch. Evans had previously portrayed the Human Torch in the two previously released Marvel movies The Fantastic Four and The Fantastic Four: The Rise of the Silver Surfer, and his casting was not well received at first. Evans is now firmly rooted in the role as Captain America after two films with a Captain America sequel on the way, Captain America: The Winter Solider. Ed Norton who portrayed Bruce Banner/The Hulk was replaced by Mark Ruffalo prior to start of production of The Avengers. Ruffalo's casting made some of the fandom nervous about his ability to fill the shoes of Norton, but these fears were assuaged once the film was released. The Avengers recently returned to the big screen for the labor day weekend adding a few more million dollars to it's box office totals.